^ "Article IV, Sec. 18, Pennsylvania Constitution". ^ "Official Pennsylvania Election Returns". 26 April 2016. ^ "Official Pennsylvania Election Returns". 8 November 2016. ^ "Treasurer Torsella". Retrieved 20 December 2018. 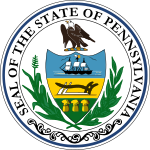 ^ "What you need to know about the Pa. treasurer candidates". 14 October 2016. ^ "PA Election Returns, 2016 Presidential Election". 10 December 2018.